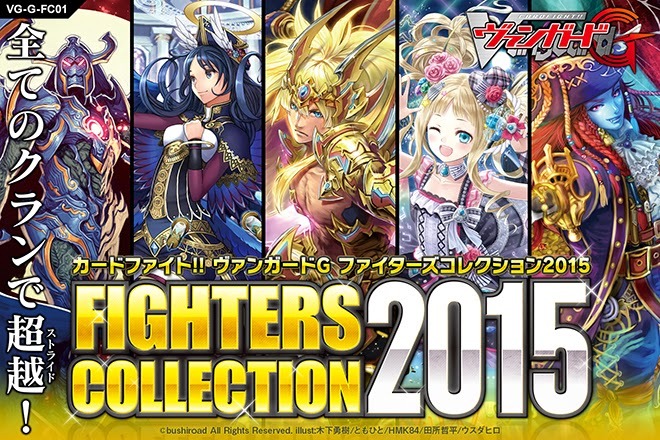 Yesterday Duel Portal dropped the first promotional materials for VG-G-FC01: Fighter's Collection 2015, quickly followed by an update to the Japanese portal site. FC2015 promises to introduce stride support for all 25 main clans sans Etranger, and the early promotions have so far revealed such cards for Gold Paladin, Angel Feather and Dark Irregulars. Concept images for the set show what appear to be Bermuda △ and Granblue strides. 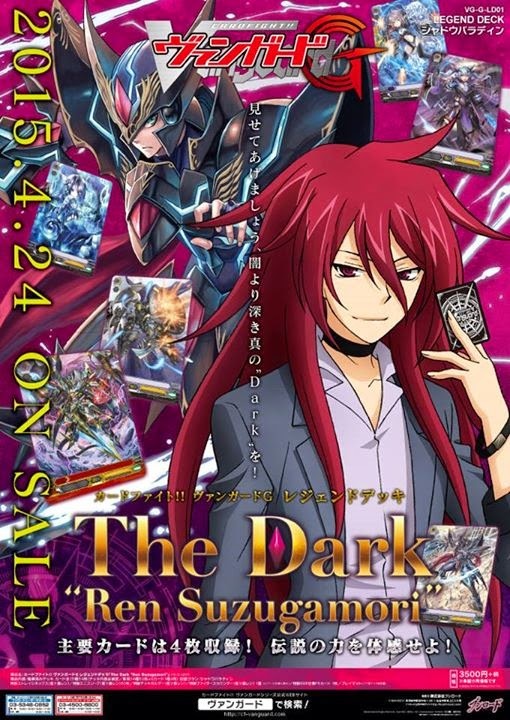 Furthermore, a Nicodouga broadcast from Bushiroad teased a poster for the upcoming Legend Deck 01: The Dark “Ren Suzugamori,” to be released this April. 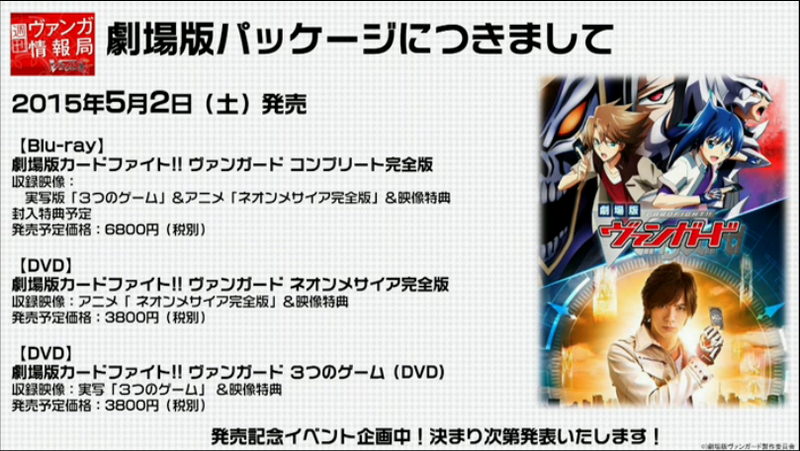 The same broadcast also gave a Japanese release date for the DVD and Blu-ray prints of the Cardfight!! Vanguard anime film, Neon Messiah. The movie recently debuted in theaters in Singapore, subtitled in English, but there has been no word on other international releases either in the United States or in Europe. This has proven problematic for fans, as the currently airing season of Cardfight!! Vanguard G features the film's principle antagonist Ibuki Kouji, and presumes the viewers have previously seen Neon Messiah. The home video edition of Neon Messiah will hit Japanese shelves on May 2nd, and will retail for 3800 yen on DVD (approx. $32 US) and 6800 yen on Blu-ray (approx. $57 US.) The Blu-ray edition also contains the live action film The Three Games. While these prices will likely appear exorbitant to western fans, but are par for the course in Japan where DVD and Blu-ray sales are typically low and appeal to a niche audience. Out of FC2015 Gold Paladin is receiving Purgation Lion King, Mithril Ezel (浄罪の獅子王 Jouzai no Shishiou "Sin-cleansing Lion King") a support card for the Ezel subclan previously expanded in BT06, BT09 and BT13. Like his preceding grade 3 incarnation Ezel Scissors, Mithril is a field unlocking unit that counters Link Joker decks. However, he also takes elements from his original debut as Blond Ezel, superior calling and gaining power from a rearguard. 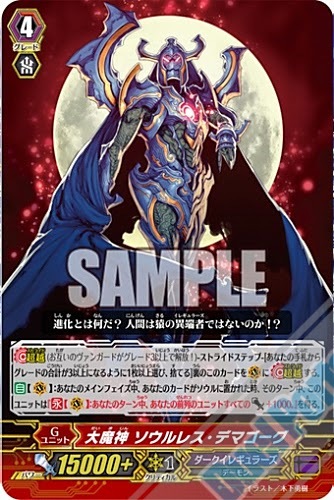 ACT (Vanguard circle): [Counterblast 1, Choose a face down card named “Purgation Lion King, Mithril Ezel” in your generation zone, turn it face up] If your heart has "Ezel" in its card name, you may pay the cost. If you do, unlock all of your locked cards, look at 5 cards from the top of your deck, choose 1 card, call it to a rearguard circle, shuffle that deck, during this turn, increase both that unit and this unit's Power. The number increased is the original Power of the unit called by this ability. Unlike other stride units, because of his heart restrictions Mithril Ezel is specific to the Ezel subclan and will not work outside of an Ezel deck. 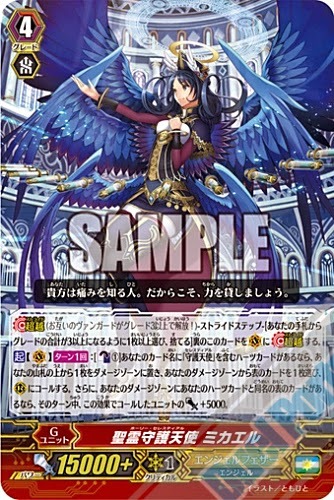 This is a running theme for the FC2015 cards, as Holy Celestial, Michael (聖霊守護天使ミカエル Seirei Shugotenshi Mikaeru "Guardian Angel of the Holy Spirit, Michael" with the forced reading of "Holy Celestial") is also specific to one subclan. Her skill is designed to build field advantage similar to Kiriel from years past, but also carries on the Celestial-specific mechanic of gaining power bonuses based on having a copy of the vanguard in the damage zone. 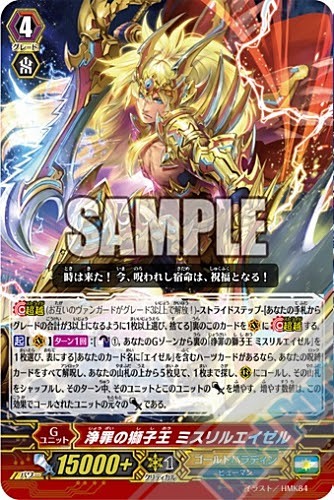 ACT (Vanguard circle): Once per turn: [Counterblast 1] If your heart has "Celestial" in its card name, put the top card of your deck into the damage zone, choose a face up card from your damage zone and call it to a rearguard circle. Then, if you have a card with the same name as your heart in your damage zone, the unit called with this ability gets Power +5000 until end of turn. Finally, the Great Devil Soulless Demagogue (大魔神 "Great Demon God") emulates an old play style of Dark Irregulars, conserving card skills until the moment of his stride and then mass soulcharging to gain power bonuses. AUTO (Vanguard circle): During your main phase, when a card is put into your soul, until end of turn this unit gets "CONT (Vanguard circle. ): During your turn, all units in your front row get Power +1000." The soulcharges that Demagogue amasses are only useful on the turn that he is stridden. Like other strides, one of the best ways to use him at present is to take advantage of him receiving the name of the heart. By running Demagogue in an Amon deck, one can make use of the Hell's Draw and Hell's deal line to get off 4~6 soulcharges in one turn, stacking up instances of his continuous skill to give +6000 to the front row. After two turns of this, it leaves the soul set up for cards like Astaroth that depend on having a preexisting base of soul.